Maho returned to Japan to live in 2015, and visited the UK whilst on her European Tour for a day of workshops, making this her fourth. In this third workshop with Maho, we concentrated on Duets - how 2 dancers really connect with each other, creating strong energy, followed by Let's Fade where we drilled slow and fast moves with simple, exciting and affective fades! Dancers were treated again to tea, coffee and cakes!! This second workshop we arranged with Maho was all about 'slowing in right down', with both Level 1 and Level 2 concentrating on the slow moves of ATS®. After tea and cake, half way through the afternoon we broke off to do a flashmob 1000+ Joyful Bridesmaids in honour of our teacher and mentor, FCBD® founder and Director Carolena Nericcio, who was married today .... CONGRATULATIONS Carolena & Loretta!!!! 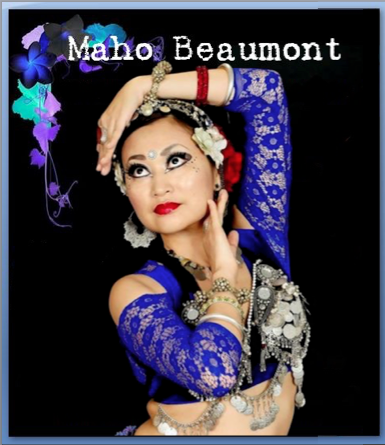 Ashnah arranged for Maho to come to Abingdon where she taught a Level 1 and a Level 2 workshop. We had a fabulous afternoon of dancing, tea and cake and are looking forward to many more with her! Many thanks to all who came and participated. Watch this space for the next one!! Enjoy the slideshow above and the short taster video below!